Delicate Arch is one of the main attractions in Arches National Park. 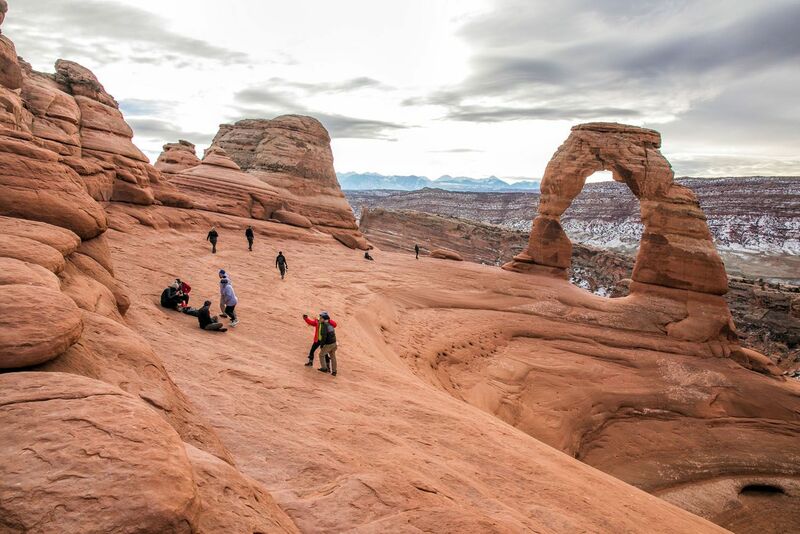 Most likely, this arch is high on your list of places to visit in the park. 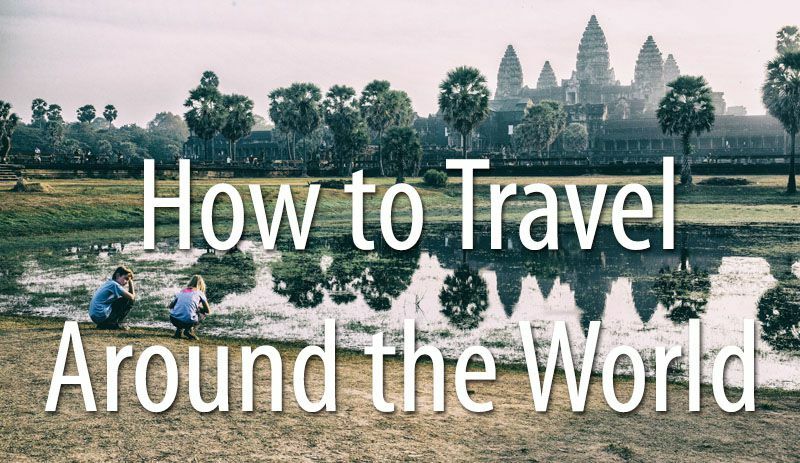 In order to have the best experience, there are a few things to know before you go. 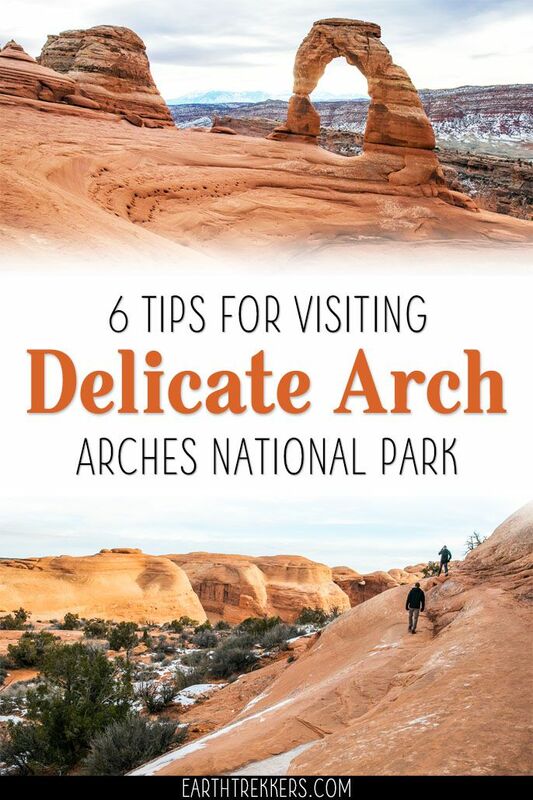 Here are our tips for visiting Delicate Arch. 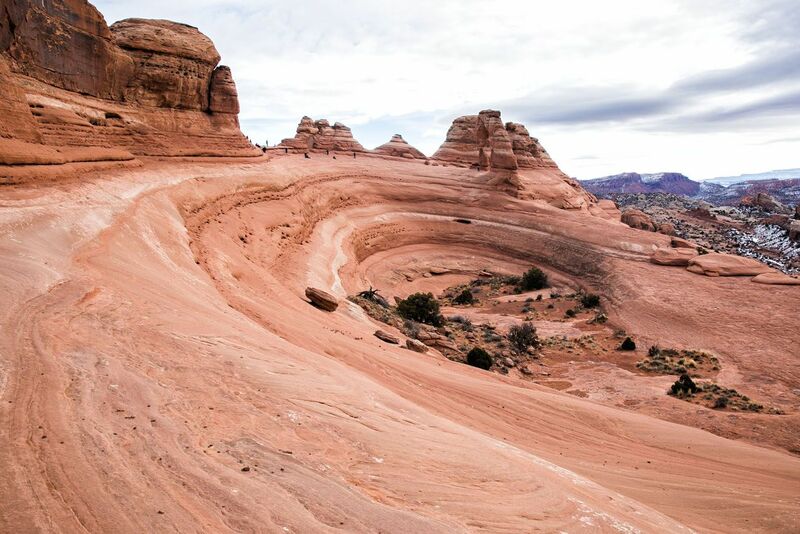 Delicate Arch is one of the most famous geologic structures in the world. 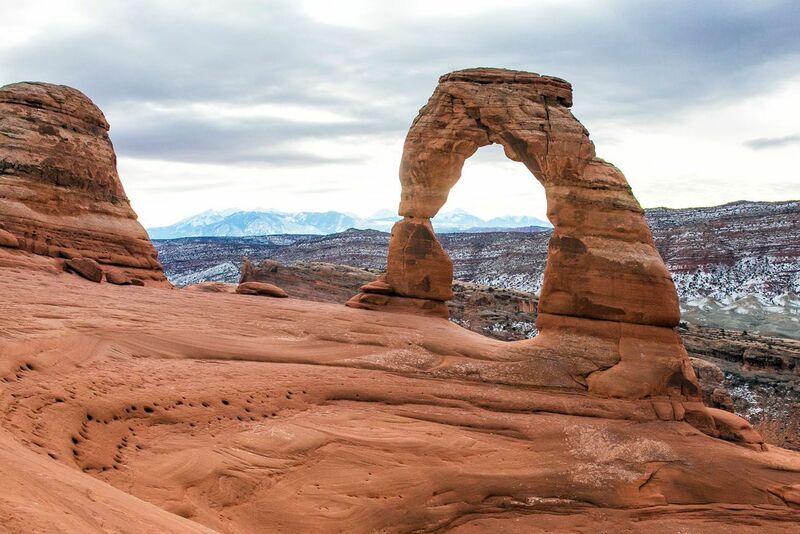 It is so iconic that you will see it thousands of times as you road trip through Utah…on local license plates. 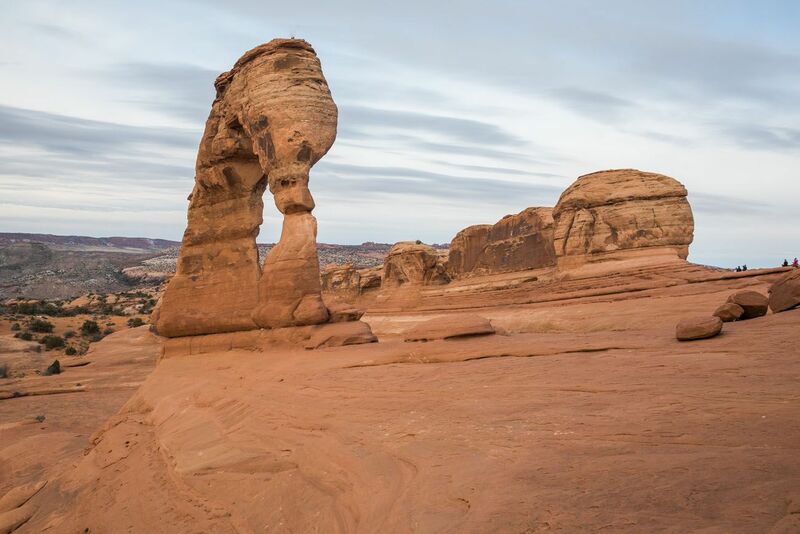 It may not look like it in photos, but Delicate Arch is massive. 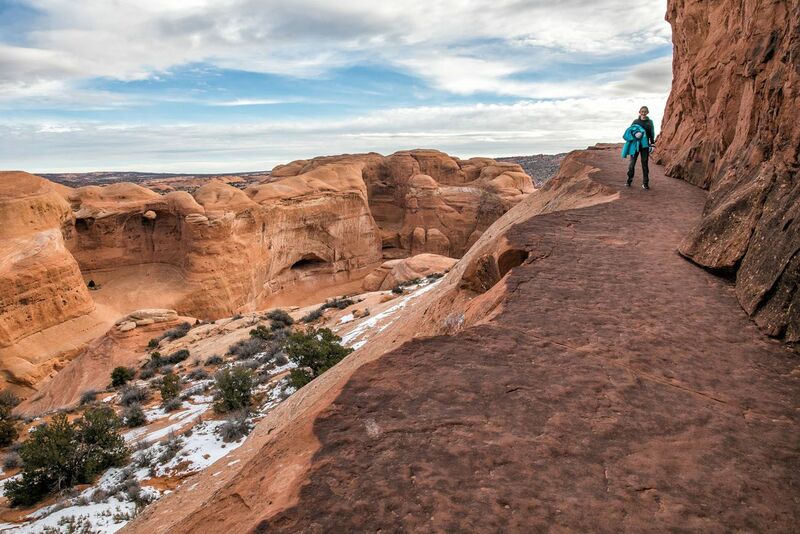 The opening below the arch is 46 feet high, making this the largest free-standing arch in Arches National Park. 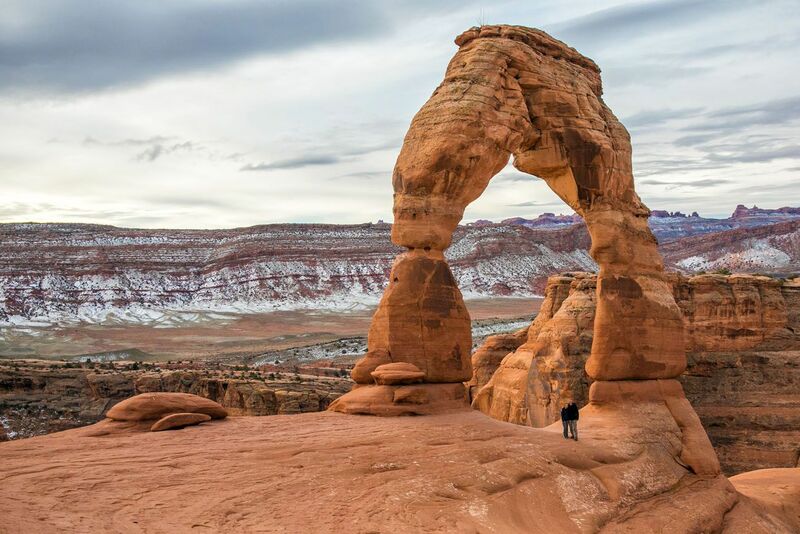 It’s not until you see a photo of someone standing under the arch (or you stand under it yourself) that you get an idea of just how big it is. 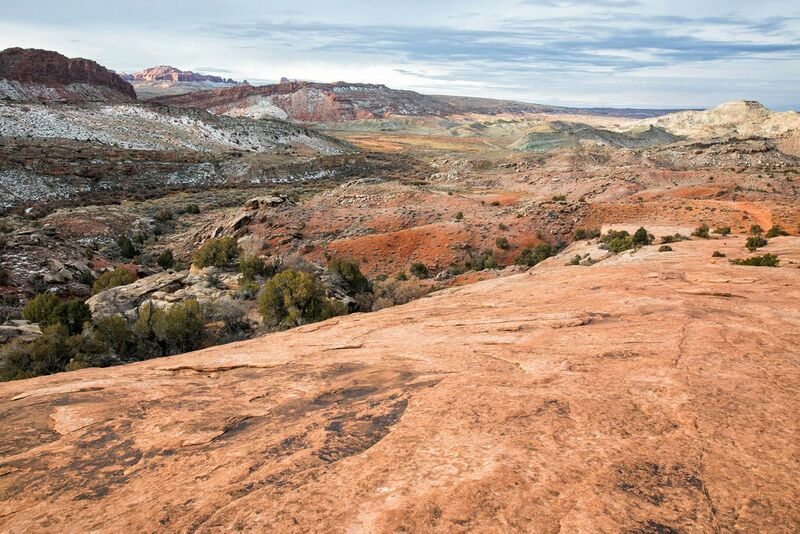 The Olympic torch was carried under Delicate Arch for the 2002 Winter Olympics. 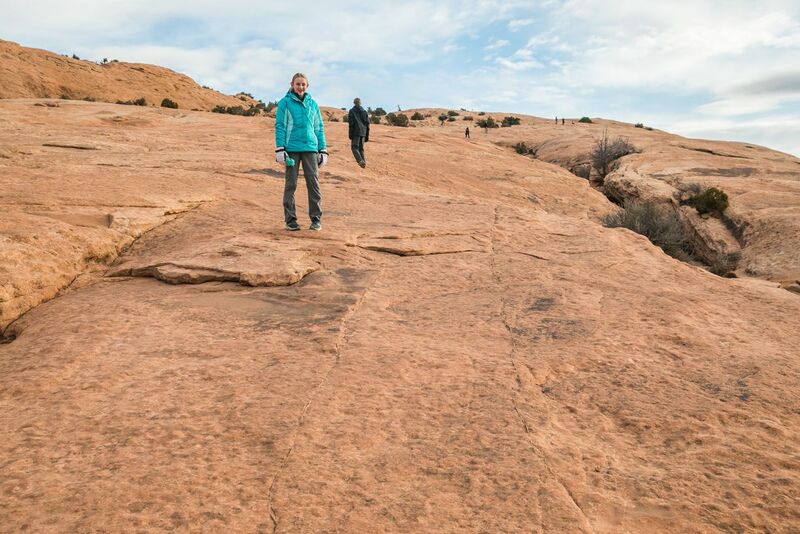 To get to Delicate Arch, it is a 3-mile round trip hike with 480 feet of elevation gain. 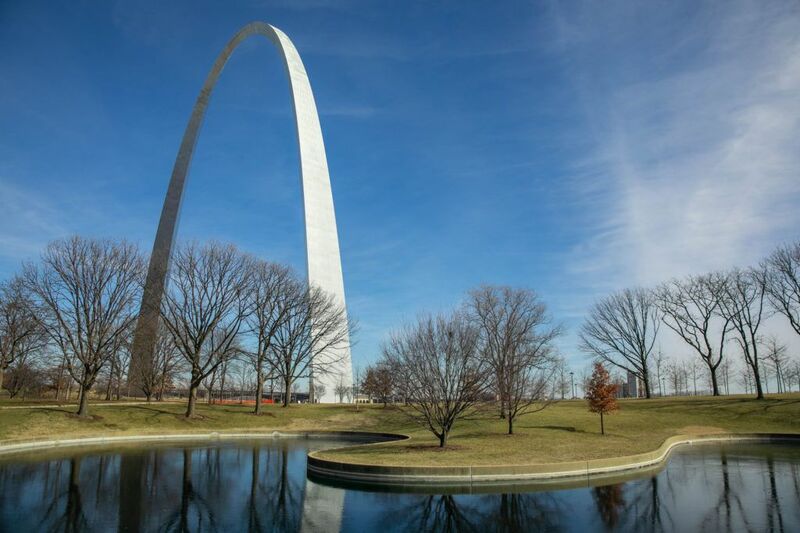 This hike, plus time to view the arch, takes most people 2 to 3 hours. 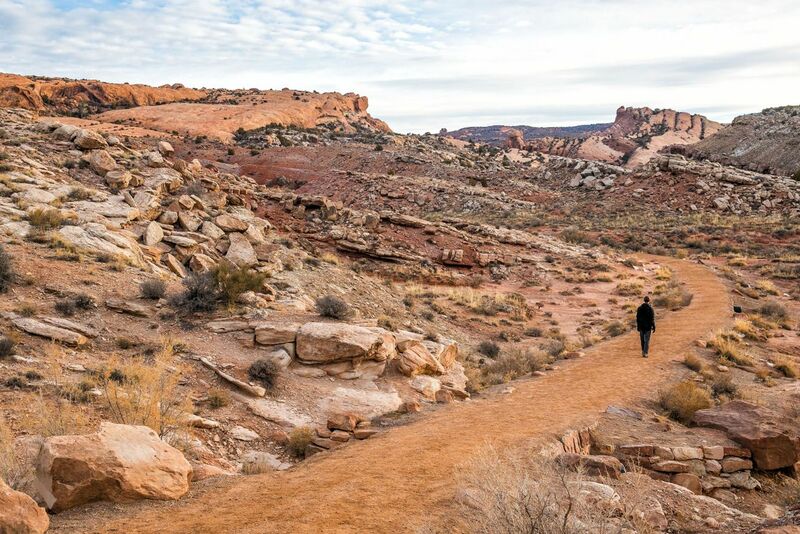 The National Park Service describes this hike as difficult. I think “difficult” is a bit of a stretch, unless you happen to be hiking midday during the summer months. The hike starts at the Wolfe Ranch Cabin. Park in the large parking lot next to the cabin and look for the sign that marks the trailhead. The first section of the trail is an easy walk on a graded gravel path. There are some short climbs here but nothing too strenuous. The hardest part of the hike is the middle third. This is where you will walk up a steep section of slickrock. Along the way, follow the rock cairns or the people in front of you. Hiking to Delicate Rock is a very popular thing to do so most likely you will share the trail with other hikers. 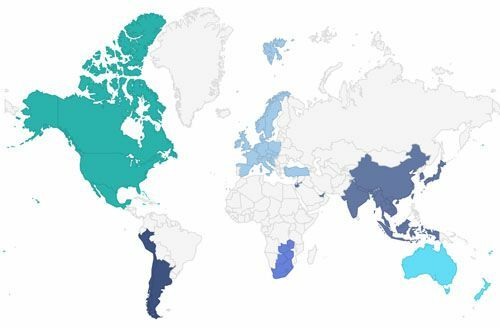 The higher you climb, the better the view gets over the park. Once past the slickrock, the trail levels out. 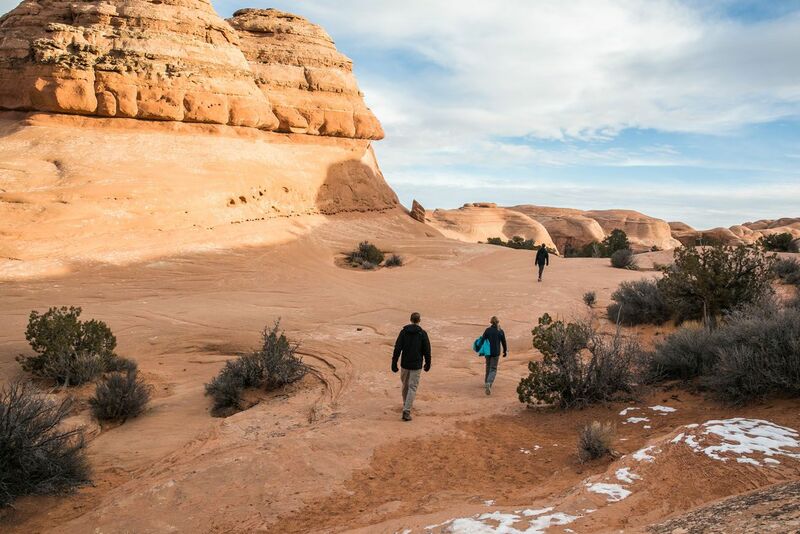 Now you are hiking among giant domes of sandstone rock. Continue to follow the cairns. The last section of trail is along a ledge that hugs a rock wall. There is a drop-off here on one side so be careful. 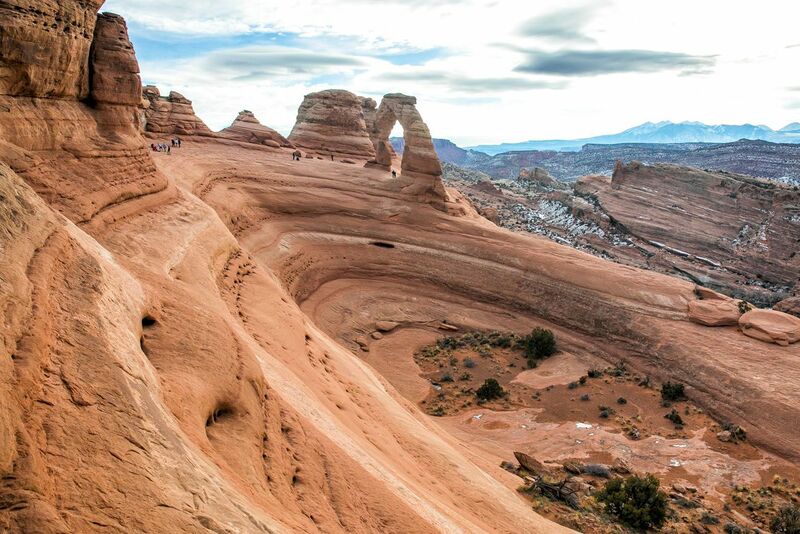 Once you round the final turn, you get your first up-close view of Delicate Arch. The best time to photograph the arch is at sunset. At the end of the day, the warm light from the setting sun illuminates Delicate Arch, casting it in a warm glow. This makes the arch look fiery red during sunset. Sunset is a popular time to visit Delicate Arch so it can be crowded, especially during the summer months. Sunrise is another popular time to photograph the arch. However, the sun rises behind the arch, creating a much different effect than seeing Delicate Arch at sunset. 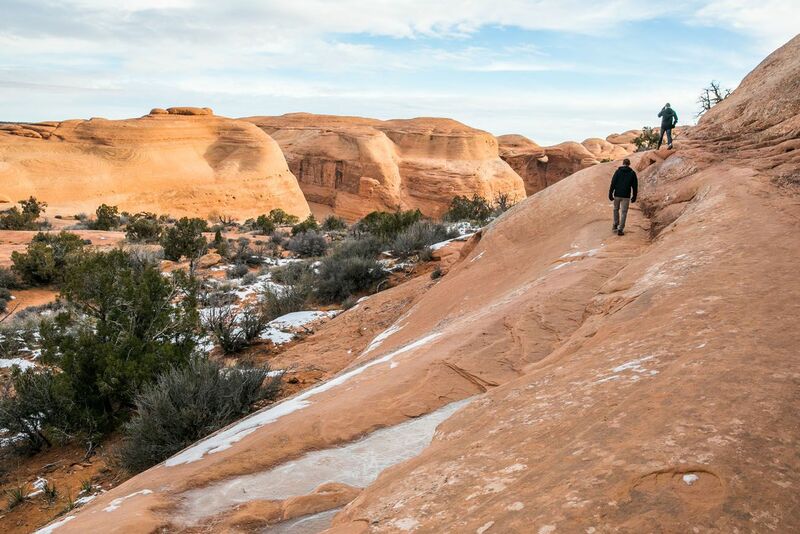 If you plan to visit Delicate Arch at sunrise or sunset, make sure you pack a headlamp, warm clothing (it can get chilly once the sun sets), plenty of water, and snacks. 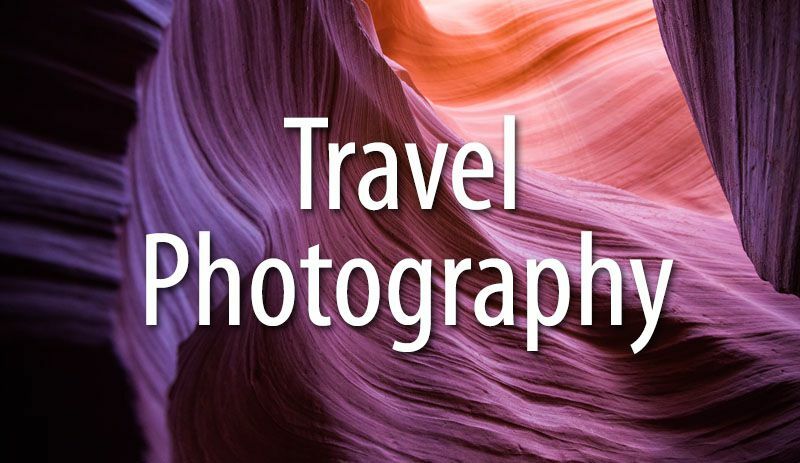 If you have a wide-angle lens, pack that in your bag, too. The best time to see Delicate Arch without the crowds is early in the morning, just past sunrise. If you want the chance to have Delicate Arch to yourself (or just share the experience with a handful of people) it’s worth rolling out of bed early and heading right to Delicate Arch. We visited Delicate Arch just past sunrise on a cloudy December morning. In this case, the clouds worked in our favor. They obstructed the harsh sunlight so I could take photos of the arch without it being too back lit. There were about 10 to 15 people here, which wasn’t too bad, considering it was a holiday week. By the time we started the hike back to the parking lot, more and more people began to roll in. Tyler gets the credit for “discovering” this spectacular viewpoint. Just before you round the bend to get your first view of Delicate Arch, there is a small opening in the giant rock wall to your right. 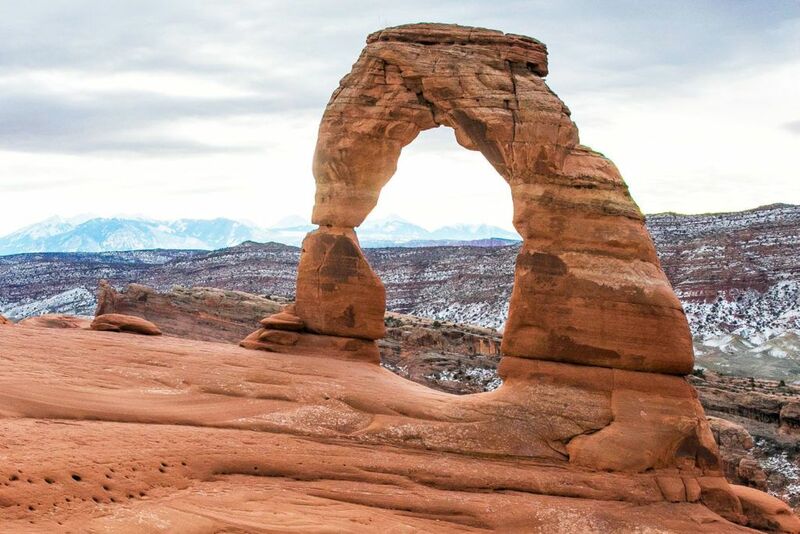 This arch, called Twisted Doughnut Arch, is one of the most unique spots to take a photo of Delicate Arch. It wasn’t until after our visit that I learned that this little arch has a name (and maybe the best name of all the arches in the park). 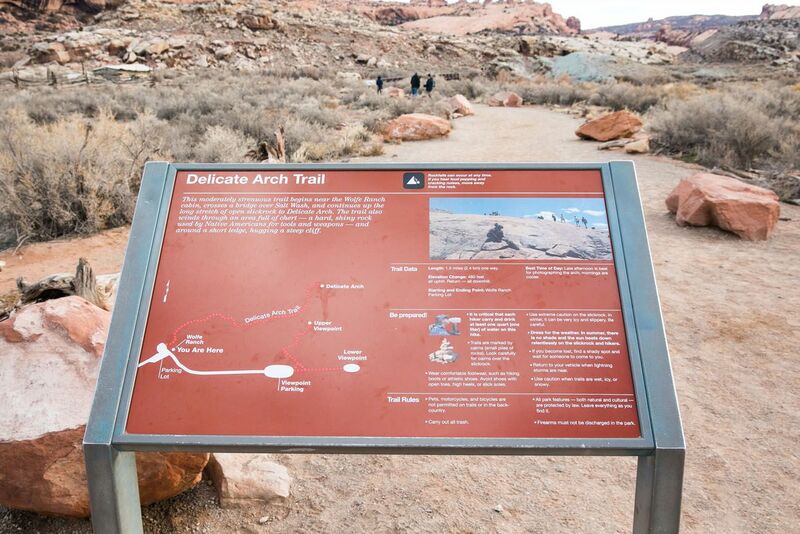 So no, we didn’t discover it, although I never read anything about Twisted Doughnut Arch before our visit to Arches. Tyler just happened to spot it during our hike. I didn’t do this, but if you want to take a very unique photo, you can frame Delicate Arch in Twisted Doughnut Arch, just like in this photo. 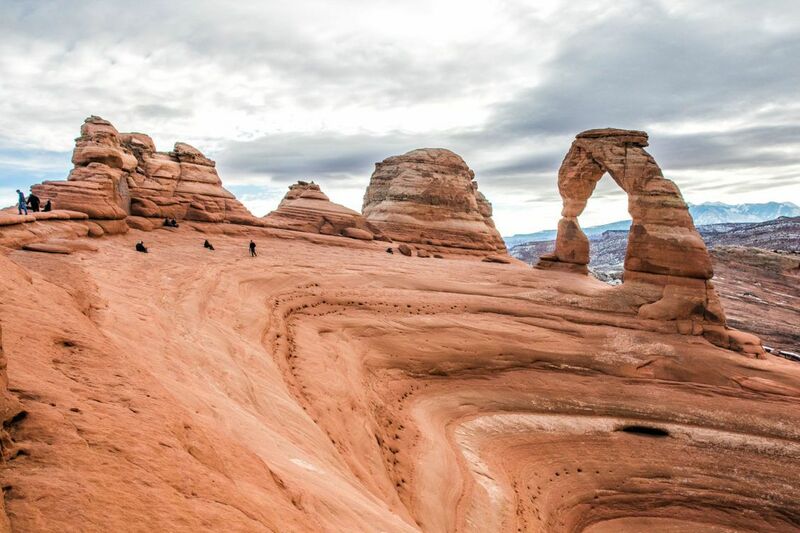 Rather than just taking a few photos from the first viewpoint, take some extra time to view Delicate Arch from numerous other viewpoints. The arch sits next to a large “bowl.” You can walk out to the far end of the bowl for another unique photo of Delicate Arch. 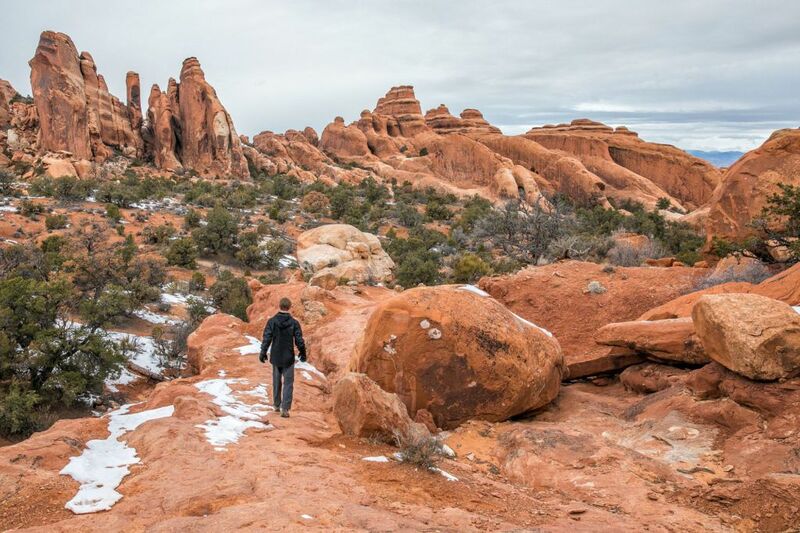 During the summer months, Arches National Park can feel like a furnace. In July, average daytime highs hover just below 100°F. On many days, midday temperatures can creep up over the 100° mark. 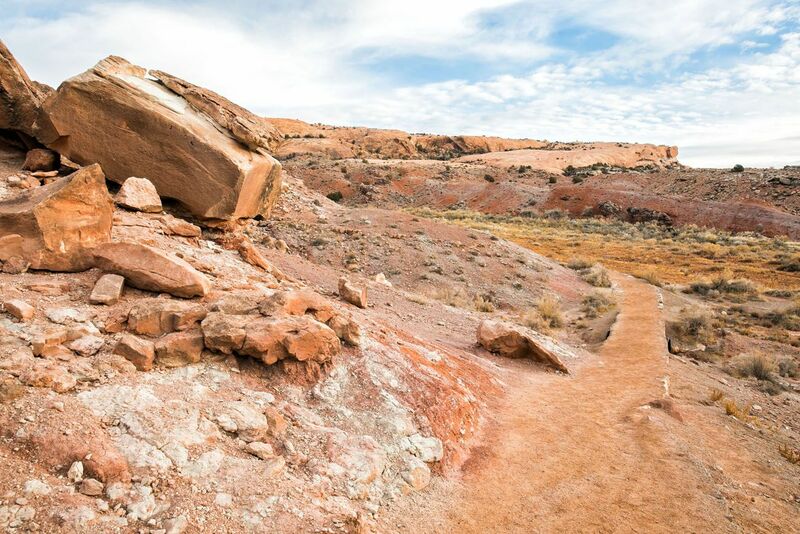 There is zero shade on the trail and the sandstone rock absorbs the heat from the sun, which makes conditions feel even hotter. If you are visiting from June through August, consider skipping this hike midday. Temperatures begin to cool off around sunset. Or, get here early to avoid the heat (and the crowds). 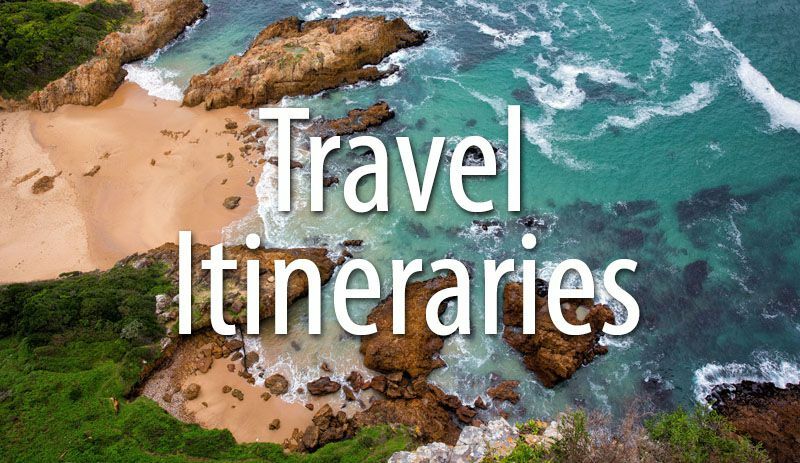 Bring sunscreen and carry at least 2 liters of water per person. 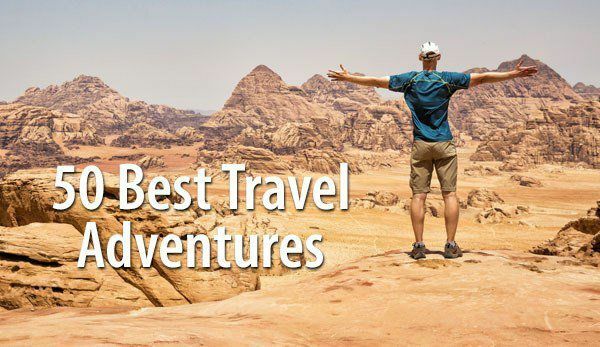 Read more about Arches National Park in our article 10 Best Things to do in Arches National Park. 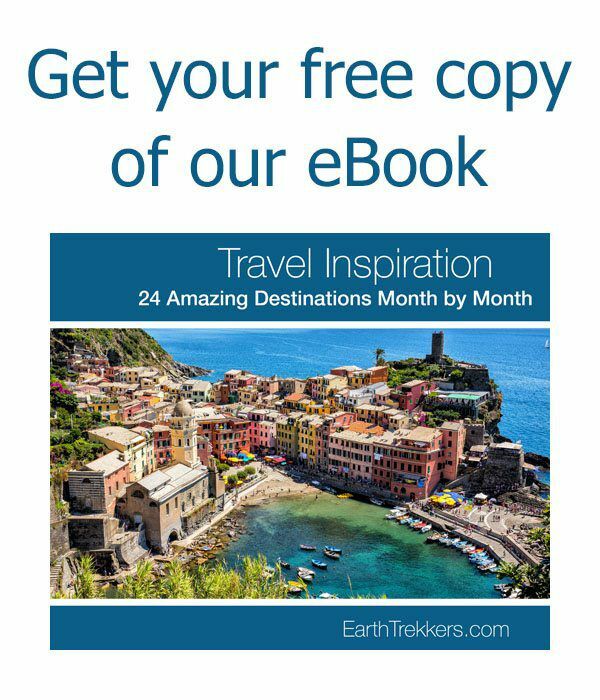 Are you planning a visit to Arches National Park? 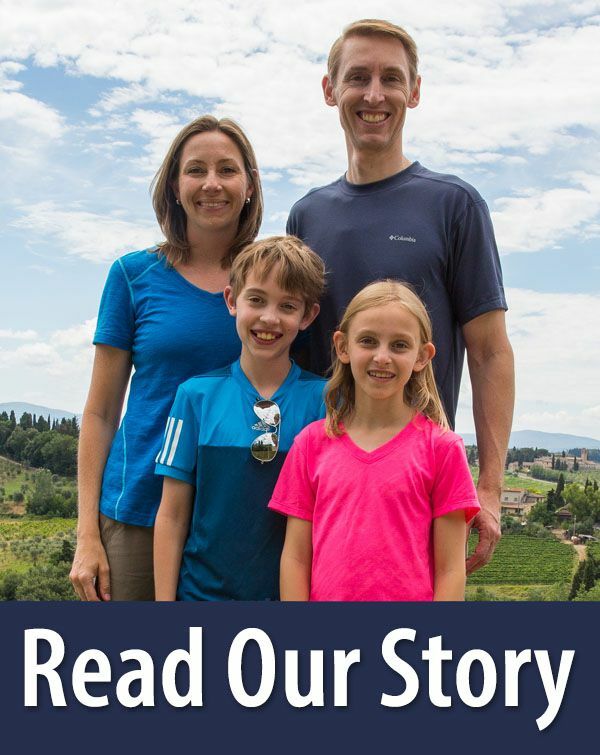 If you have questions or want to share your experience, let us know in the comment section below. 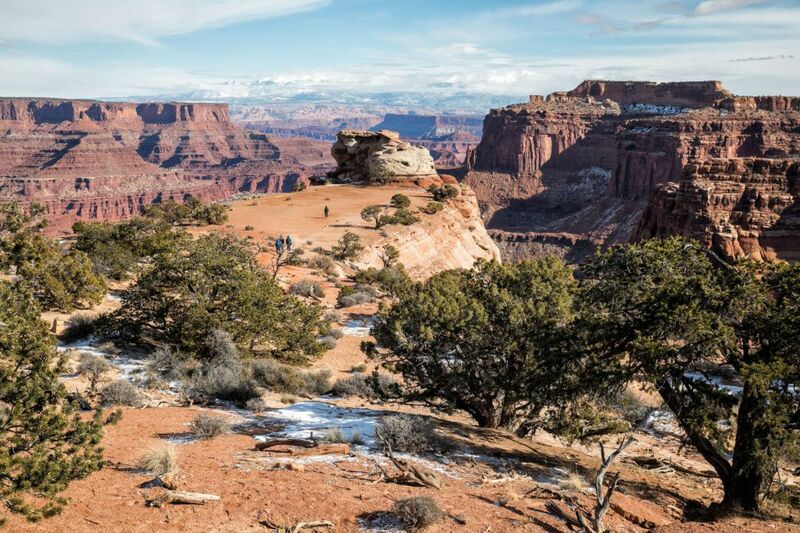 Read all of our articles about Utah in our Utah Destination Guide.